Join us for a variety of amazing EVENTS for people of all ages and skills. Come on down to the Marietta Brewing Company to get a head-start on the weekend and enjoy a few brews with your fellow outdoor-lovers. Visit with friends & make plans for the weekend. This will be one of your first chances to buy RTA Fest Merch! New Wineskins will be part of RTA for the 2nd consecutive year! Come and join us Sunday, Aug. 12, for a conversation about the intersections between physical and spiritual health. Happy half-hour (social time) at 6:30pm, program begins at 7:00. What to Expect: A spin-off of Walk with a Doc, this will be a ~5 mile paddle with Dr. Tom Bartsokas of Memorial Health System. Dr. Bartsokas will provide a short educational talk on health and fitness. The group will then do a leisurely paddle down river and end at the Williamstown boat ramp. Paddle is guided but unsupported. Participants should bring their own gear, food, water, etc. For boat rental and shuttle information, contact the Marietta Adventure Company. Gnome Adventure Hike @ Kroger Wetlands - round 2! Who doesn't want a second chance to go hiking for gnomes?! Family/Kid-friendly, this is a less than 1 mile hike at the Kroger Wetlands. Fun for adults and children of any age. Be on the lookout for small gnomes along the way; word is they like to have their picture taken with the kiddos! NOTE: Please show up a few minutes early to check-in with the hike leader. Head out for a trail run on the Marietta City Trails! Meet at the festival HQ to sign up and then head out for a 10:00 a.m. departure. This will be a 3-5 miles run that departs from the East Muskingum Park. RTA Fest Group Mountain Bike Recovery Ride! Wind down the festival with this group ride on the Marietta City Trail System's 30+ miles of quality single track trails! This "recovery" ride (1-25 miles) will also feature the newly created West Virginia Interscholastic Cycling League riders. RTA Fest Sunday Group Road Ride! 43 miles: SR821 to Germantown to Dalzell to Stanleyville and back on SR26 (https://ridewithgps.com/routes/27734851). Group rides are free, but all riders must register at the festival grounds prior to the start of the ride. Group rides have several ride leaders but are unsupported. Please bring all water, food, and repair items that you may need. 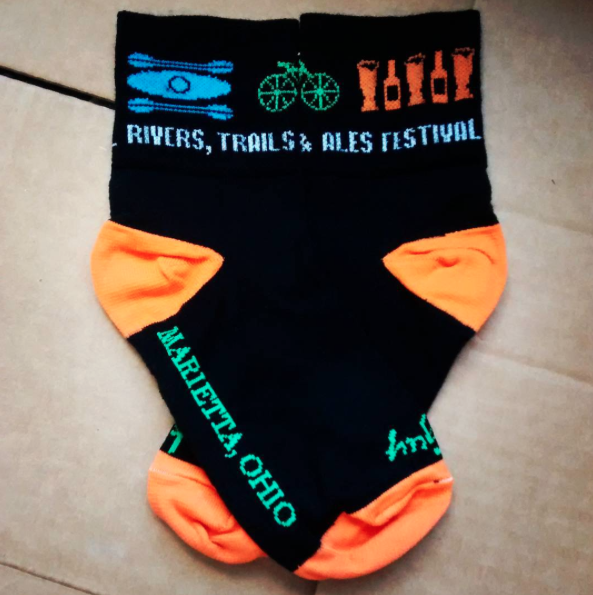 All Group rides leave the festival HQ in Marietta Ohio. If you prefer to head out on your own, stop by to pick up a free map and route directions. Explore Broughton's Nature and Wildlife Education Area by foot! Meet up with local trail aficionado who will lead the group on a 1-1.5 hour hike through the Broughton's trail systems, just one of the many local outdoor treasures we have to take advantage of in the Marietta area. MEET UP Location: Turn right off route 60 onto Millgate Road, drive 1/2 mile to the trailhead at the end the road. If you drive or bike up a large hill with a beautiful 180 degree turn you are heading in the right direction. There will be signs pointing you along. This will be a slow but powerful flow yoga class that follows a basic sequence of poses to allow students to practice moving the body and breath together in a mindful way. It is suitable for beginners yet still appropriate for the more seasoned yoga student. RTA Fest Sunday BIG Road Ride! BIG Road Ride: 57 miles (self-supported) - departs from East Muskingum Park: SR821 to Germantown/Dalzell/565/260 to SR26 and then back to RTA HQ. There will a stop available at mile 18.5 (famous Dalzell Carryout) and then a water and a bio-break will be provided by the Little Muskingum Volunteer Fire Department at mile 42. Remember - Group rides have ride leaders but are unsupported. Bring all water, food, and repair items that you may need. A map will be provided. Picking up sweet RTA merch! Kick off the last day of RTA with a Sunrise Paddle around Buckley Island. Meet up at the Williamstown boat ramp (101 Julia Ave, Williamstown, WV) for a 7AM departure. Completion of the ~8 mile paddle will be celebrated with donuts and coffee afterwards! Paddle will be guided but unsupported so be sure to bring your own gear, water, etc. This is event is sponsored by our friends at Jackie O's Brewery, who will be doing a full Tap Takeover in The Adelphia in celebration of the Rivers, Trails and Ales Festival!!!! An RTA tradition sponsored by the River Valley Mountain Bike Association ! Two-person teams on bicycles face off! One team member travels as fast as possible while the other travels as slow as possible. The "turtle" on each team is restricted to a small area and once started, cannot put their feet on the ground. 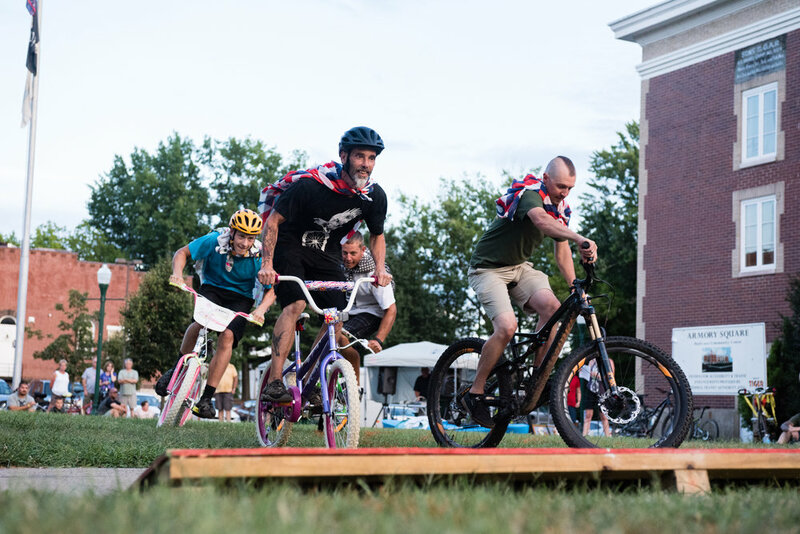 The "hare" will simultaneously race around a short circle track with obstacles while riding a children's bike! Teams are eliminated if the Tortoise puts their foot down or leaves the Tortoise box. Time is restricted to a maximum on 3 minutes. If teams make it to 3 minutes than those with the most laps wins! WORLD championship starts immediately following the bike parade. Stop by the festival HQ to sign up --- Space is limited! Trophy goes to the World Champions. 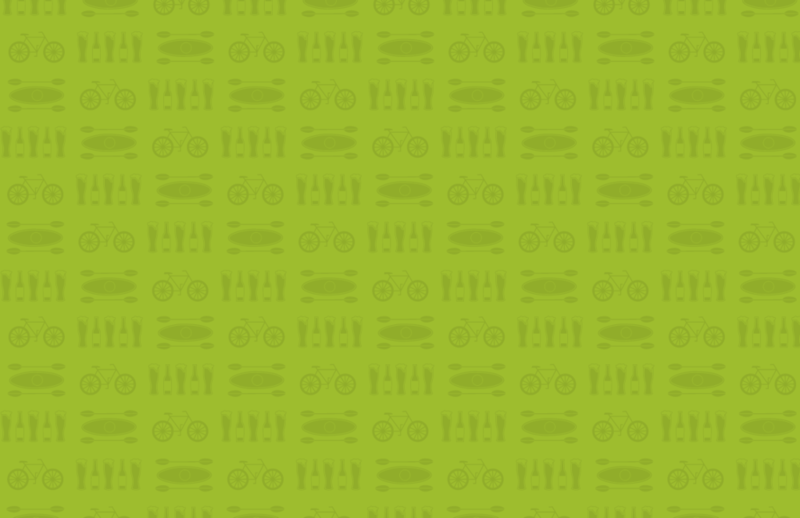 Come back to the Festival Headquarters with your bike to ride in a celebratory lap around town! The parade route will start down the bike path towards the fairgrounds, loop back along Front Street to the Ohio River Fountain, and loop back to the Armory on the bike path. Decorate your bike if you are feeling festive and enjoy a fun new tradition! Stick around after for the RTA Raffle & the Tortoise in Hare World Championship! You might just win a new bike! RTA is kicking it up a notch this year and expanding to an outdoor BEER FEST in our beautiful riverfront park. Presented by Marietta Brewing Co., the RTA Beer Fest will feature 13 local breweries, amazing food trucks, live music by OYO, awesome kiddo activities, and much more! Online ticket sales NOW AVAILABLE @ https://bit.ly/2ODuNBo (until 9pm Aug 9). Admission will also be available at the RTA HQ as well as at the "door" during the event. Group ride on the river bike path! Meet at the festival HQ at 2:00 p.m. with your bikes and helmets. Fun, free, and all ages welcome! A vinyasa-style yoga class encouraging slow, mindful movements and a deep connection with the sound of your breath. This class is intended to encourage you to bring the focus inward where the true yoga practice takes place. Class will end with a short meditation to allow all of your hard work on the mat sink in. You will step away feeling balanced, rested, yet rejuvenated. NEW this year, Brick Insurance Group Inc./Nationwide will be providing a "Make Safe Happen" program that includes a bike trivia wheel, a brain display to demonstrate the fragility of the brain, and a helmet fitting mannequin. So bring the kids and their bikes to the festival HQ for a free bike safety check, a chance to be a part of "Make Safe Happen", a bike obstacle course, and some fun games! No matter your age, be ready for a good time! There will be a Strider Bikes Adventure Zone for kids 44" and under (18 months to 4 years) and other bike activities for the bigger kids. Don't have a helmet that fits? We will fit you and get you set up with a new one! Afterwards, join in on the Family Fun Ride at 2:00 p.m. on the River Trail bike path! Join Listermann Brewing Company at the House of Wines during the River, Trails and Ales Festival on Saturday August 11, 11am to 3pm. HOW will feature a special brunch menu and 3 Listermann Brewing Drafts. Make sure to stop by the HOW during RTA for Kegs N' Eggs! Ever been curious about dragon boating? This is a perfect time to check out a dragon boat, learn about technique, and get out on the water for ~1 hour with a dragon boating coach. The local MOV'n Dragon boaters will be hosting this RTA special event at the Carl L Broughton boathouse located at 814 Gilman Avenue. RTA Saturday Group Road Rides! Washington County boasts some of the most scenic road riding in the state! Cruise out and enjoy scenic farms, hilly wooded landscapes, and nicely paved roads. Group rides are free but all riders must register at the festival HQ prior to the start of the ride. Group rides have several ride leaders but are unsupported. Please bring all water, food, and repair items that you may need. RTA Saturday Group Mountain Bike Rides! The Saturday group rides will take place on the Marietta City Trail System, 25+ miles of quality singletrack trails ready for action! The trail system is accessible from downtown, making it easy to head back for a burger and brew after your ride. Rides may start as one ride. All rides are unsupported. Bring your own water, gear, flat repair kit, etc. There will be several ride leaders but the group may become spread out. Group rides are free but please register for the ride prior to departure. If you bail out early from the ride please let someone on the ride know and/or check in at festival headquarters. Download the MTB Project app for access to the full maps of the Marietta City Trail System. RTA Intro to Trail Running! Have you been interested in trail running but just don't know where to start? Well RTA has an answer for you! Please join our local trail running group, Marietta Trail Runners, as they provide an overview of what trail running is, things to keep in mind, what to prepare for, and post-run advice. Then you will head out for an actual trail run! What to Bring: Dress for warm temps, tennis shoes (or trail running shoes), and you may want to throw a towel in.